This recipe is adapted from this recipe I found online a few years ago. Feel free to play with the spices- you could even just dump some pumpkin pie spice in there and call it a day. These muffins are part of my “Self-Care” plan this week- an attempt to nurture myself, relax and have a little fun. It worked really well, but I have to say that ideally, one should not multi-task and bake while doing a Yin practice at the same time. I had to leave Half Butterfly to take ’em out of the oven. What can I say: I’m still a student when it comes to relaxing. After I Instagramed a photo of my muffins, a friend said, “Those muffins look totally comfy.” I couldn’t agree more: what a comfy muffin. Enjoy! Yields something like 18 muffins-ish. 1 1/2 C turbinado sugar (plain sugar would be okay too, of course. Or sorghum molasses. Or maple syrup, if it didn’t cost a fortune). 2 cups chopped pecans (optional. I like them toasted, which is an extra step and usually involves me burning a batch because I forgot I was doing it. Maybe you’ll do better). Preheat oven to 325 degrees and prepare your muffin pans. You know, little paper cups if you want your muffins to be wearing little jackets, or maybe just oil or a spray. Your call. Mix dry ingredients together in a big bowl. This is not the time to be lazy, you want to really get them mixed up awesomely. Separately (if you have a stand mixer, life is pretty sweet here), beat eggs, sugar, oil and sweet potatoes. Sometimes I throw in a splash of vanilla here because, well, it’s vanilla. Once blended, add your dry ingredients and mix until blended. Now, unlike the earlier step, it’s important not to over mix, so have a light hand here. Just no lumps. Finally, add in your pecans and raisins. Bake at 325* for 25-30 minutes or until your whole house smells divine. This entry was posted in Uncategorized on November 1, 2013 by laurasana. 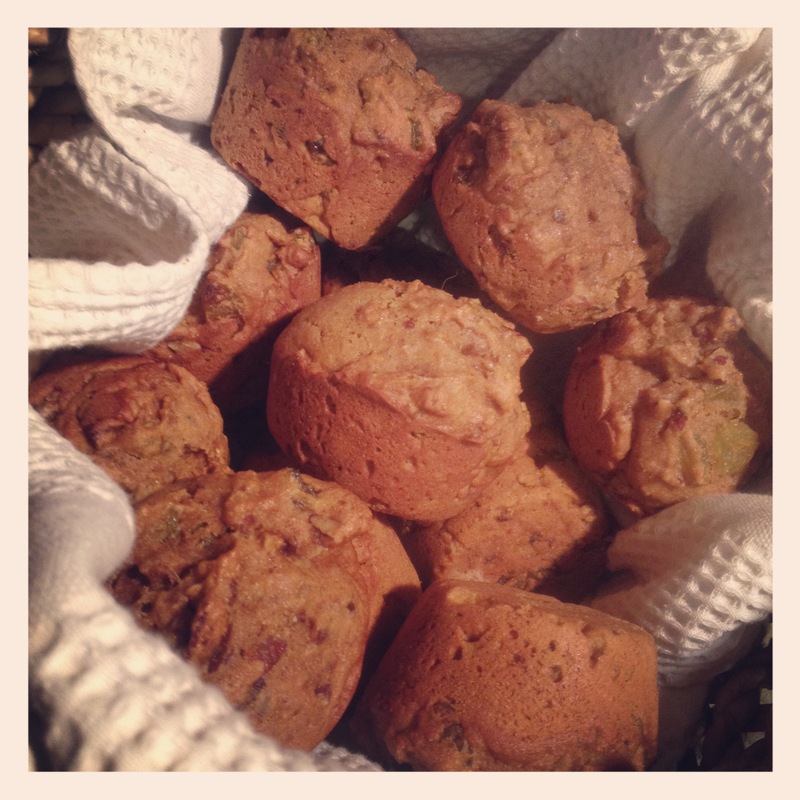 I love the idea of incorporating sweet potatoes into muffins. I am definitely going to give these a go sometime. I made them:) I didn’t have sweet potatoes… and I’ve been way behind in my muffins/bread baking…so, I subbed the bananas I had on hand. They turned out really well and were definitely comfy. I have sweet potatoes on my shopping list.